How is it Wednesday already? I fly home tomorrow for a long weekend and my baby brother is turning 23! I say baby but he towers over me. I did mean to blog sooner but I have had a mad weekend (I will reveal what I have been up to soon) then I came down with a nasty cold and ended up having Tuesday off work. Thankfully I seem to be over the worst of it now - it's amazing what a day in bed can do when you are feeling ill. So... cake! I haven't told you about the cake I made for CCC almost 2 weeks ago (June, slow down!) Well every cake has a story and this ended up being cake number 2. As our theme was English Summer I originally planned to make a cake that looked like a summer pudding but that failed disastrously! Firstly I decided to colour the sponge a nice purple colour but something happened in the oven and that cake came out green! Then to make matters worse I made such a schoolboy error and took the cake out a few mins too soon and yup, you guessed it, it sunk. It was so bad it looked like I had created a bad bundt cake (I had baked the cake in a pyrex bowl). Now, thankfully I had made the cake on Tuesday and cake club wasn't until Thursday so I knew I had Wednesday evening to bake another cake. So went to make the cake on Wednesday only to find I was all out of stork marg and would have to use butter. The batter seemed really tough when I was dividing it between the tins and when I took it out of the oven it didn't have as big a rise as normal. By this point I was at the end of my tether and it was too late to make another cake and I was all out of ingredients. Out came the buttercream and frozen berries and this fab nozzle the Craft Company had sent me to review. I sandwiched the cake with buttercream and berries then using the nozzle piped a wavy line effect and built up the layers. To be honest I was making it up as I went along but it seemed to look quite effective. A handful more berries on top and cake was done. Thanks to the Craft Company for sending me that nozzle to review. I was having serious cake block and it really gave a pretty finish. To make the cake I made a normal Victoria Sponge using Mary Berry's recipe. One of these days I will remember to photograph the stages before the cake goes in the oven - sorry! Put everything in a bowl/mixer, cover with a teatowel and whisk until smooth. Add more food colouring if required. 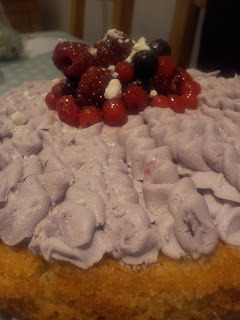 Sandwich the cake with buttercream and some berries then pipe more buttercream on top of the sponge and drizzle with a few more berries and icing sugar.